Mes Aynak or “eye of copper” in the local Dari language is home to an ancient Buddhist city and the largest undeveloped copper deposit in the world. Aynak, located in the Logar province of Afghanistan, is of historical, cultural and spiritual importance to Afghans and Buddhists alike. There are more than 20 ruin sites sitting directly above the copper deposit, some dating back 5,000 years. Situated on a central point of the Silk Road, it is believed that Buddhism reached China via Mes Aynak. Murals and sculptures discovered at Aynak show different aspects of traditional ancient life in Afghanistan as well as Buddhist practice, including a scene of Parinirvana. Afghan archaeologists, supported by the French Archaeological Mission in Afghanistan (DAFA), are racing the clock and conducting “salvage archaeology” as they struggle to document a sacred site that would take 30 years to study if done properly. 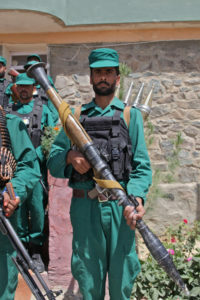 They are uncovering more of the Buddhist city daily but their efforts are threatened by local looting and the multibillion-dollar mining contract signed in 2008 by the Afghan Ministry of Mines and Petroleum, China Metallurgical Corporation (MCC) and Jiangxi Copper Company Limited (known collectively as MJAM). 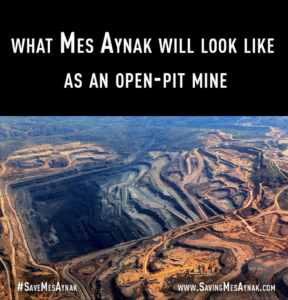 Though Mes Aynak was mined in the distant past, the large-scale open-pit mining proposed by MJAM is a road Afghanistan has not traveled before. Aynak was mined during the Indo-Greek period (2nd century BC to 9th century AD) and during the Soviet invasion of the 1970s and 80s, but in very small amounts. The mining contract has been a source of international criticism for environmental, social and political transparency concerns, including the fact that a final version was not published until 2015, seven years after the contract was officially signed. The contract is now available only in English. A copy of a draft contract from April 2008 was leaked in March 2014. War and the ongoing looting of artifacts—two of the most devastating cases: the Bamiyan Buddhas and Ai Khanum city—have robbed Afghans of deepening their cultural understanding. If mining is conducted in Mes Aynak, it will destroy the entire historic Buddhist city, including Bronze Age artifacts that are still underground. Mining will also require forced relocation of seven villages around the Aynak Copper Mine, and devastate the watershed of Afghanistan. Mes Aynak has sparked international campaigns by Afghans, environmentalists, Buddhists, archaeologists and other supporters aiming to stop the destruction of this culturally and spiritually significant site. Campaigns asked UNESCO to add Aynak to the list of World Heritage Sites and declare it endangered. Petition signatures were also given to former Afghan president Hamid Karzai, which he ignored. Though mining is currently suspended due to political insecurity and economic disputes, the MJAM contract is still upheld by the Ministry of Mines while Mes Aynak is awaiting complete destruction. Afghan archaeologists have not had the chance to fully explore and analyze Mes Aynak. Why is this Buddhist city built directly above the world’s second largest copper deposit? Mining of this site will prevent full understanding of the historical, cultural, and spiritual implications of Mes Aynak as an ancient city and sacred site. The world witnessed as the Bamiyan Buddhas, the largest Buddha statue of the world, fell to the ground in 2001. 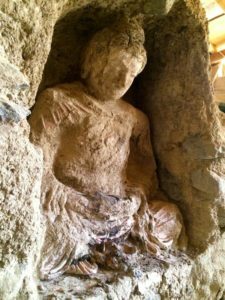 It would be an absolute catastrophe if Mes Aynak meets the same end as the Bamiyan Buddhas—this time, while in pursuit of wealth rather than political extremism. Given that the final, signed contract was not released publicly until 2015, seven years after the signing of the contract, and that the agreement has not been translated into Pashto or Dari, the people of Aynak—who are all scheduled to be or have already been involuntarily relocated from their villages—are left at a disadvantage concerning the mining contract and their rights to land and water. The villagers were not part of the contract drafting process between MJAM and the Afghan Ministry of Mines (MoM). The contract does not require consultation between MJAM and the villages. MoM has attempted to fill this gap independent of MJAM but there are still many alarming issues that work at the disadvantage of the people of Aynak. MoM has yet to outline how villagers can directly voice their concerns and complaints about the mining project or their relocation. 2 schools (divided by gender). Each with 12 classrooms. A t the time of publication, MoM has distributed six plots of residence to involuntarily relocated families and heavy Afghan security is required to protect the mine site. Logar’s mixed ethnic communities (Pashtuns including nomadic Kuchi tribes, Hazaras and Tajiks) have historically fought over land rights and are largely dependent on agriculture and water for their livelihood. There has been absolutely no indication as to whether the Ashab Baba plots are of equal quality (compared to the original villages) and desirability for the villagers. Geographically speaking, the resettlement area is parallel to a mountain, which is known for dangerous, life-threatening environmental activity during the winter. On a positive note, the contract limits water use for mining. MJAM cannot use agricultural water or any water sources that the Afghan people use for land, villages, homes or animals. But given that the contract is still not translated, there is no assurance the people are aware of and able to enforce these limitations and rights. Mining at Mes Aynak is a high-risk environmental concern. Afghanistan already has several cases of environmental refugees—communities that have been displaced due to conflict and resource mismanagement. Afghan environmental refugees have already witnessed contamination of the water, soil, air and depletion of wildlife. Afghans are largely land-based people who live outside of cities and rely on agriculture as a way of life. Hence, any and all threats to water, land and animals are a threat to the existence of Afghans themselves. Given the size and location of the Mes Aynak mining project, this is an irreversible environmental disaster waiting to happen. The copper mining itself is water-intensive. The mining of 1 ton of copper requires the removal of 100 tons of soil, which will change the meteorological balance of the area, increase risks of landslides, reduce soil fertility and release metals and radioactive materials to the air and water, threatening aquifers, rivers and aquatic populations. 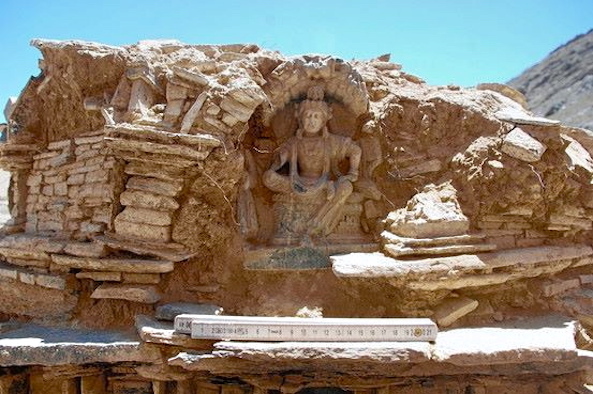 Mes Aynak sits on two of the country’s principal aquifers. Kabul city, the major population center of the country, and Logar province will be directly impacted. Afghanistan is already drought-ridden with over 50% of the Afghan population having no access to clean, safe drinking water. Rivers and wells are at risk of drying up completely. The major issue surrounding the final contract was that it was not published until 2015, seven years after it was signed. The contract is now available here. As the first foreign investment agreement in the history of Afghanistan, it is particularly important for the contract to undergo careful scrutiny, as it will set a precedent for all future resource extraction contracts. Global Witness, a London-based non-governmental organization, published an in-depth analysis of the mining contract between the China Metallurgical Corporation (MCC), Jiangxi Copper Company Limited and the Afghan Ministry of Mines. The publication, “Copper Bottomed? Bolstering the Aynak contract: Afghanistan’s first major mining deal,” gave thorough criticisms and recommendations to the Ministry of Mines to strengthen and renegotiate the contract (based on a draft contract leaked in April 2008) in order to fully protect and defend Afghanistan’s natural resources, people and economy. Global Witness warned against the lack of transparency, vague contract structure, inadequate community reparations, flaws in economic provisions, danger to security forces, environmental hazards and the destruction of an invaluable cultural heritage site. MoM dismissed the 82-page report with a mere 1-page statement on their official website defending the fairness of the contract, highlighting the economic need of the mining, and confirming that all contracts are available online (Note: Mes Aynak’s final contract is now available to view on MoM’s website). They also instructed Global Witness to conduct fieldwork in the area (which was already a methodology in the report). The statement failed to explain how the Afghan people, environment, and resources would be fully protected in response to the 95 recommendations proposed by Global Witness. Among all of this, archaeologists at Mes Aynak have been repeatedly rushed to finish excavations that would otherwise take at least 30 years to complete. Afghan archaeologists worked without pay for seven months and then went on strike against the Ministry of Mines in May 2014. Security is also a great concern in the area given multiple attacks on security and looting of Buddhist statues. As of March 2014, MCC is attempting to renegotiate contract terms due to security concerns. MCC hopes to renege a portion of the royalty rate, railway, power plant, and copper smelter. Renegotiation has continued in private and mining has been suspended for the time being pending better security and results of contract renegotiation.